The Mary K. QUartier de Dejeuner. Photo Esther Szeben. Breakfast is an underrated dining experience. My friend Olivia taught me this. If you love sharing meals with friends and realize that 52 Friday nights or Saturdays limit the amount of socializing you can do, breakfast just added a whole myriad of possibilities! Quartier du Dejeuners is a relatively new restaurant that opened on the West Island. Having heard by word of mouth that it was good, we decided to try it on our most recent breakfast escapade. We went on a weekday morning around 10 a.m. and it was quiet. This slotted us between the early-bird rush and the lunch crowd, so we had excellent service! A few minutes after sitting down, my friend Ilaini came in with her family, so I was thrilled that I would be able to base my review on more than two meals (I’ve learned that strangers have an aversion to being interrogated about their meal, especially if you’re not the one serving it to them). Two Eggs Sunny Side. Quartier du Dejeuner. Photo Esther Szeben. Designing Tasteful Experiences is their motto, and they do justice to their claim. 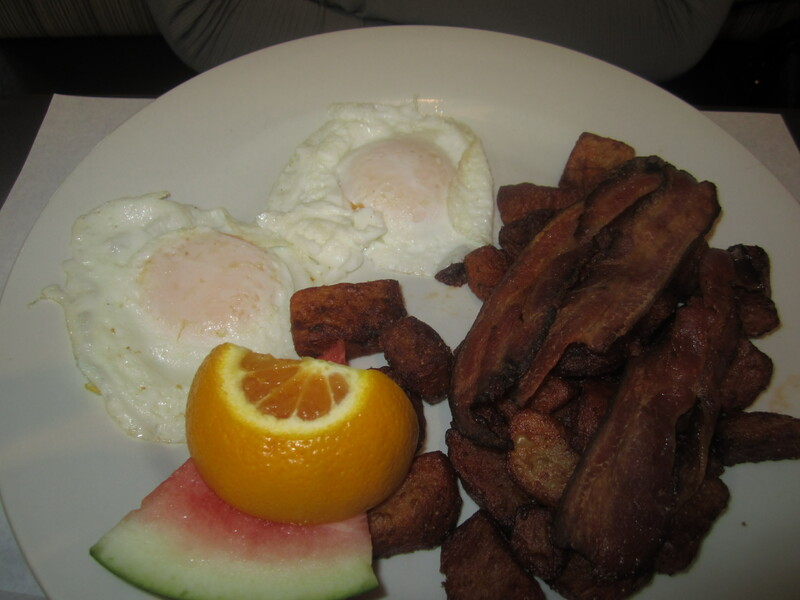 The breakfast menu is extensive. 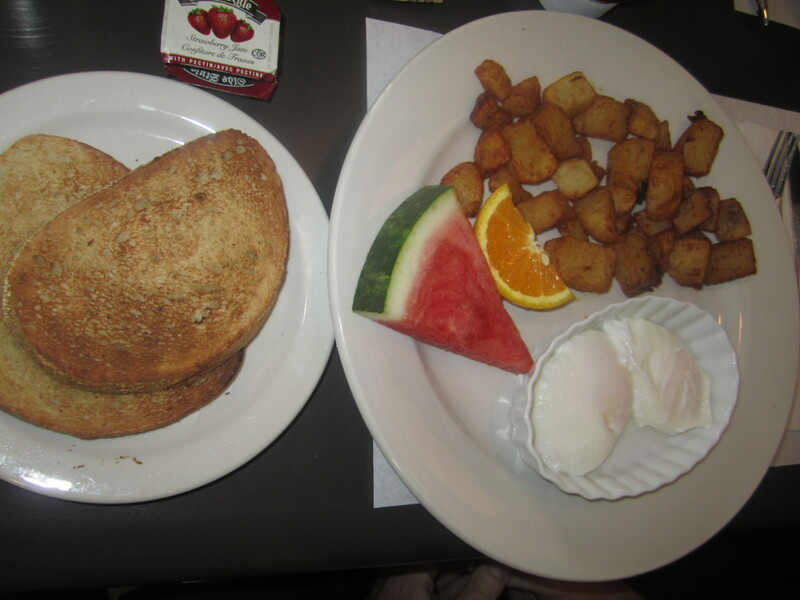 They have a well-designed format for building your breakfast: the egg plates consist of one egg, made to your liking ($4.95 or two for $5.95) and comes with fresh fruit, potatoes and a side of toast with bottomless cups of coffee or tea. 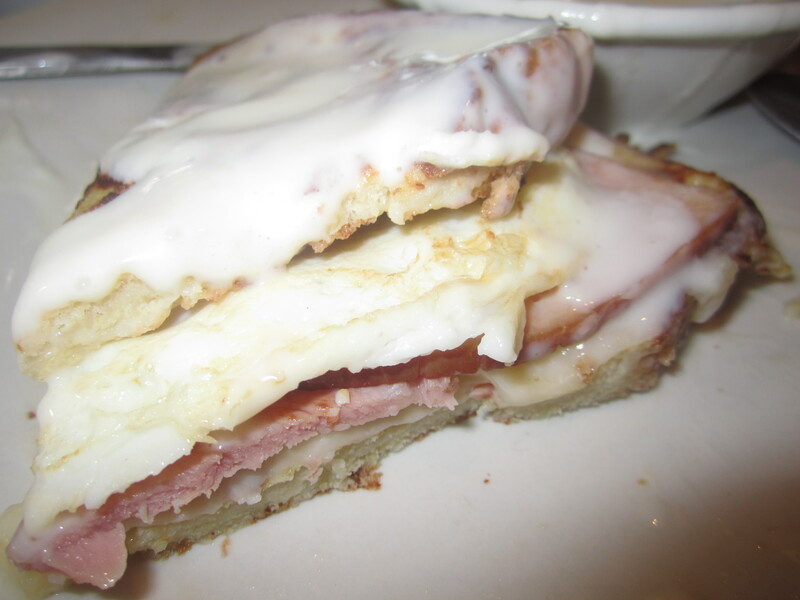 You can add additional ingredients from the following choices: sausage, ham, Italian sausage, creton, baked beans, pancake, French toast, tomatoes and lettuce, cheddar or Swiss cheese, for about $2 each addition. Two eggs Poached. Quartier du Dejeuner. Photo Esther Szeben. 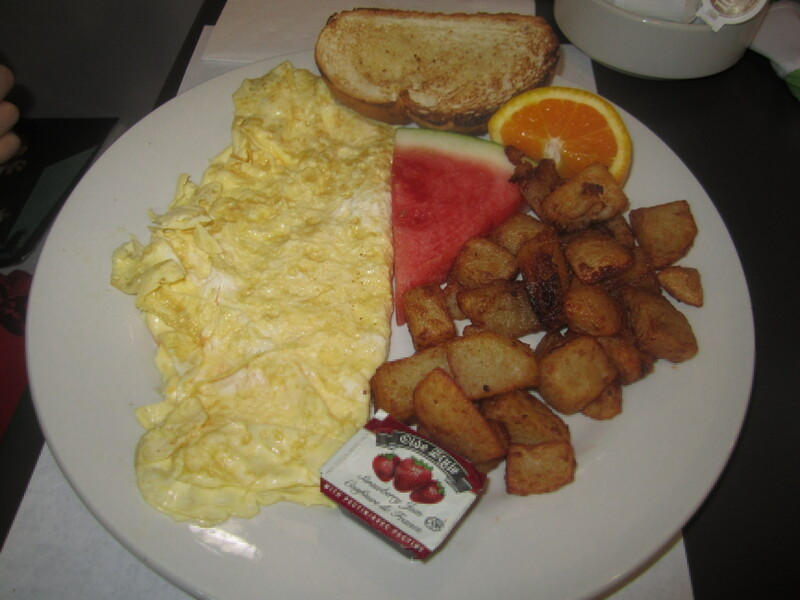 An entire section of the menu is dedicated to Eggs Benedict, a whole section is reserved for Omelettes, a Kids menu with very reasonable prices ranging from $3.75 to $5.50, and a healthy corner consisting of fruit cups, egg white omelettes, bagels and English muffins adorn the pages of the menu. As you turn the pages, entire sections with anywhere from five to a dozen choices of buttermilk pancakes, sweet French crepes, savoury crepes, and waffles leap out at you. I chose, (after long, LONG deliberation) from the French toast selection: the Mary K: two French toasts stuffed with 1 egg, ham and Swiss cheese, served with Fresh fruit and English cream for $11.95. I loved it! It was hearty, and salty and sweet and filling all at the same time. C’mon! I can make pancakes and omelettes at home. My parents taught me well — when dining out, order what you can’t prepare yourself (or in my case, won’t). Olivia, on the other hand, is fit and always orders healthy. She also runs marathons and climbs mountain peaks like Kilimanjaro. I on the other hand nourish myself with additional breakfast calories, while I listen to her regal me with stories of her marathon and climbing achievements! She had the two egg combination with bacon and was satisfied. I went over to Ilaini’s table and asked how everyone enjoyed their meals. I was also in the company of healthy people, Ilaini (a Yoga instructor) and her visiting brother from Florida, had just come back from a run! 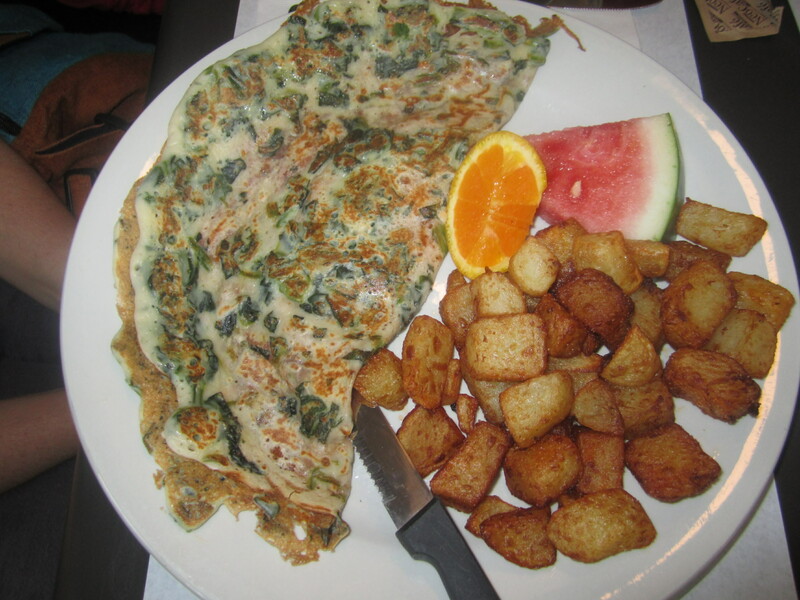 She had the spinach omelette which she said was a little plain. Perhaps a stronger cheese or the addition of onions would have jazzed it up a bit. Her brother had a two egg combination as well (poached, that’s how healthy he is) and Ilaini’s son ordered from the kids menu, a cheese omelette which is apparently his usual. Kids Omelette. Le Quartier du Dejeuner. Photo Esther Szeben. Their lunch menu is also substantial. They have some greasy spoon pickings, poutine, smoked meat, burgers, soup of the day along with some less conventional panini’s, pasta, chicken and steak dishes. If you’re like me and it takes you a while to order, I would definitely peruse online before heading over to the restaurant. Especially if you chose to do this on a week-end. They recommend reservations for this busier time. You might pass Le Quarter du Dejeuner by as you drive down Sources Boulevard. It is huddled in a strip mall and does not resemble the charming French bistro they chose for the image on their website. In this volatile business where restaurants can come and go rapidly, this is one of those places that I really hope makes it! LE QUARTIER DU DEJEUNER is located at 1858c Boulevard des Sources, Pointe-Claire, QC H9R 5B1, Canada. Hours are 5:30 a.m. to 3 p.m., Monday to Friday; 6 a.m. to 3 p.m. on Saturday; and 7 a.m. to 3 p.m. on Sunday.